Fuchsias are one of the most popular plants grown thanks to their striking and unmistakable nodding, and often bi-coloured flowers. There are approximately 100 species, mostly from temperate areas, and more than 15,000 hybrids and varieties. They vary from small trees to shrubs and cascading ground covering plants. 4. The Most Commonly Grown Varieties. There are over 8,000 Fuchsia cultivars, mostly either derived from F. magellanica and F. fulgens; or derived from F. triphylla or related species. This lesson concentrates on these two groups. Identify common fuchsias that are grown commercially and sold in and suited to your region. 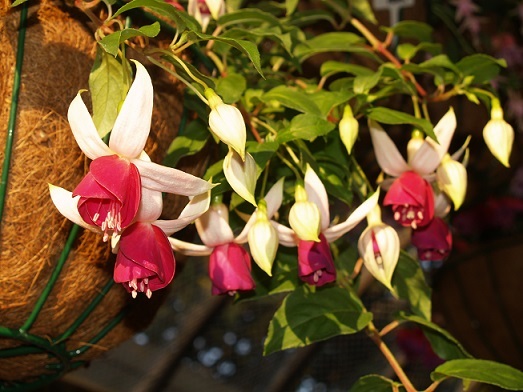 Identify a range of ‘species’ fuchsias suited to your locality. Outline methods for producing ‘exhibition quality’ fuchsias. The ideal temperature range for most fuchsias is 18 to 240C. Many varieties stop putting on new growth when temperatures exceed 240C. All gardens have a cool spot, such as under steps, a shaded wall or courtyard, or beneath taller trees, and these are the places you should consider growing fuchsias. They prefer a well-drained, loose soil high in organic matter. If you have clay or sand, it is necessary to fork through large quantities of compost or well-rotted animal manures before planting. Once established, fuchsias need regular, heavy feeding to perform well. Young or heavily pruned plants can be fed a high nitrogen fertiliser but once established, use a balanced fertiliser with good levels of phosphorus and potassium as well as nitrogen. An excellent fertiliser for established plants is one of the slow release pellet types applied every three to four months. Magnesium deficiency can cause yellow streaks or spots on older leaves when a fuchsia has been grown in the same soil for many years. This is easily corrected by sprinkling a couple of pinches of Epsom salts around the base of the plant. Remember that a plant that grows quickly and flowers profusely requires nutrients capable of sustaining this growth. Always water your fuchsia plants in the morning, if possible. Watering at night can result in the spread of fungal diseases such as ‘damping off’ and cause the dropping of flower buds. Avoid the temptation to overwater if fuchsias wilt a little on a hot day. The soil may still be wet enough, but the foliage is simply not able to take up water fast enough. If the soil gets too wet and soggy “root rots” can develop. However, do water frequently during dry spells. Place hanging baskets on the ground, or floor of the shade house, in very hot weather. Foliage can be sprayed with a fine mist of water to prevent wilting and to cool the leaves. This will prevent plant stress on a hot day.